I don't think I look like a "sponsor" if I admit that I am favourably disposed towards the Indiana Line brand. Besides reminding me of the magic (for Hi Fi diffusion - in Italy, Tr. -) period of the Seventies, the firm's products are amongst those that, while presenting a MSRP that endeavours to be as restrained possible, can offer a general build and musical quality, surely interesting and pretty consumer-friendly. 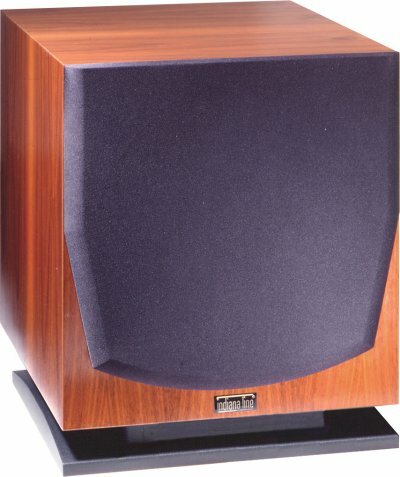 I still harbour extremely pleasant memories of the slim Arbour 5.20 towers, loudspeakers with which I lived for quite some time and that did surprise me for their generous and moving performance. Thus I was rather curious to taste the quality of the object of this review, the Arbour Sub. The firm recommends using the Arbour Sub with either A/V (its woofer is shielded) and Hi-Fi systems. Actually, there are several other subwoofer models in the Alcor production line - among them, in the more prestigious range, the Arbour Cinema Sub, which is part of the Arbour Cinema loudspeaker set, that also includes the front loudspeakers, a central loudspeaker and the rear loudspeakers. While simple, Arbour models look rather fine and elegant, and don't seem out of place even in highbrow listening rooms. The Arbour Sub is no exception and, although its dimensions aren't exactly negligible, its good veneering and its modern design with its interesting technical design avoid the risk of looking like the classic black cube, aesthetically cumbersome and basically out of harmony with most living rooms. The glossy walnut veneer looks very well done, considering its price, and makes for a fine match with the matt black of the base and of the woofer's front protection grille. The base, BTW, also acts as acoustically correct spacer for the down-firing box's port; because it's placed at a properly calculated distance, it acts as an acoustic load for the reflex port, for better subwoofer performance. So, what we have here is an active reflex-ported subwoofer, sporting a 26-cm shielded driver, with polycell membrane and rubber suspension. The internal amplifier was specifically designed to optimise frequency response and to perform phase electronic control, and features a programmed signal amplitude limiter to reduce "clipping" distortion. There are a pair of RCA inputs (LINE IN), that can even be used singly, and a pair of RCA 70Hz-12dB/ott filtered outputs, to connect an amplifier for the satellites if required. There is also a volume control, a regulator for the crossover frequency, a polarity inverter (0-180 degrees), a switch between manual and automatic amplifier on/off, and an IEC power cord socket. Once properly broken-in, the Arbour Sub sounds powerful and refined. Low frequency reproduction is rather transparent and well articulated, with good impact and ample control. This can limit the risk of introducing that confusion, that sort of "monotonicity fest" that are typically provided by products of this kind, made rather to impress the newbie than to satisfy discerning listeners. Thus, it's not difficult at all to follow the development of the acoustic texture presented to the listener by those few instruments that can cover the lowest frequency range, like electric bass and cello. Here, you won't risk limiting the enjoyment of music such as acoustic or electronic Jazz. Yet, far from sounding thin and dry, the Arbour Sub's characteristics are such that it can reproduce bass in a really smooth and enveloping way. Lovers of tense and nervy sound be warned - while respecting the mandatory accuracy, transparency and articulation, a good humoured mood rules here, with pastel colours that, although correctly contrasted, tend to a soothing and absolutely "non-neurotic" interpretation of the musical message. It's a decidedly successful result, that finds its strong point in the balance between the different significant parameters. Moreover, this allows for a good level of synergy with most of the little loudspeakers on the market that won't find their design philosophy compromised for the sake of subwoofer placement and regulation, and, at the same time, benefit from a strong support in the lowest frequency range. Crankin'up the volume, you can appreciate the advantages of the type of tuning chosen. I'm back just a while on technical aspects, just to specify that here we have what could be defined as a hourglass-shaped tuning port. It features an exponential opening both at its output, where its link to the base is round-edged to slow down the output air flow, as well as at its input, to limit port self-noise. Compared to the more traditional solutions of a simple cylindrical pipe port, the listening difference is a reduction in the noise generated by the airflow itself, with a clean and accurate sound. A last little note: listening at low volume, as it sometimes happens during night-time relaxation, can really benefit from this subwoofer, whose action gives to the low range that body usually lacking in little bookshelf loudspeakers that operate in this situation. Mr. Renato Fornasieri, Eng., Indiana Line designer, explained to me that this is obtained thanks also to the type of tuning chosen, which is rather low, being said to have the effect of improving the system's dynamics at moderate volume levels, such as those you rightly set in an urban flat at night-time. A set of conical spikes, placed under the subwoofer, helps the articulation and transparency of the low range. Don't underestimate the importance of the sub's placement. In my room, I didn't meet with any problem - placed in the first space available, it instantaneously worked fine, without the necessity of moving it around. The phase-inverting switch can prove very useful when you don't have many placement options. I didn't have to use it and this, considering my previous experience, quite surprised me. Mr.Fornasieri later told me that the Arbour Sub is already set up with a phase inversion of 180 degrees, since they thought it was acoustically more apt for most domestic configurations (a little more service for the not-so-expert customer...). A good break-in period (but not excessively long) made the sound emission more coherent, eliminating those little smearings that, straight out of the box, all new loudspeakers usually show (more or less). Most "straight" audiophiles often tend to disparage sat + sub loudspeaker systems. And, listening to some of those set-ups, you can't really blame them. This negative judgement is nourished on badly implemented systems, whose subwoofer crossover frequency is sadly set too high, often because the satellites' microscopic dimensions don't let them reach down even to 150 Hz, being more quantity-oriented than quality-oriented. But make a little effort to forget this sad (?) reality in the Hi-Fi world, and think of that pair of little bookshelves you love for their musicality, precision and timbre. Those little loudspeakers that you always appreciated notwithstanding their objective limits in the low range. Yes, I know, you always tried to understand their personality, and you constantly repeated to yourself: "They sound so well because they are made just like this, and they must be accepted for what they are. If they had a realistic low range as well, they probably wouldn't be themselves". Now, I certainly don't want to be the one who makes you change you mind, but allow me to make a little suggestion. Place a good active subwoofer (like this Indiana Line Arbour Sub) with the mandatory attention to obtaining the best sonic result. Let your little loudspeakers do whatever they can in the low range and then, setting on the sub the lowest crossover frequency possible (during my test, I remained around 60 Hz), so avoiding overlapping as much as you can, let the sub be the ideal prolongation downward of your loudspeakers down to the limit (for the Arbour Sub) of 25 Hz. Be careful not to make the usual mistake of exaggerating the effect with the sub's volume control set too high, because this could ruin most of the optimisation work you have done, along with the final result, that would be somewhat unnatural.